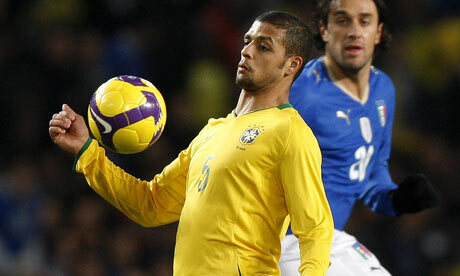 Is Brazil’s Felipe Melo the midfield answer for Arsenal? 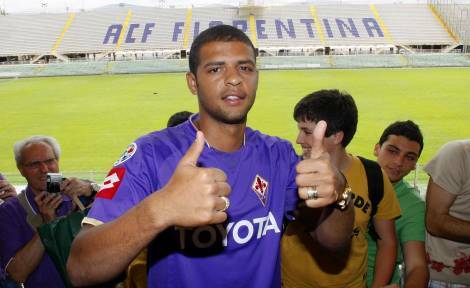 Arsenal could really use Felipe Melo. The 25-year-old Brazilian had a great season with Fiorentina in 08/09, and he’s playing well for his country right now at the Confederations Cup (he scored against the USA). Melo is the perfect type of player to protect Cesc Fabregas at the heart of Arsenal’s midfield. He reminds me of Gilberto Silva; both men are tall, athletic and powerful, but Melo is more aggressive and dynamic than Gilberto, who was perhaps a little too passive for the Premier League (which is one reason why I think Arsene Wenger overlooked him for the captain’s armband). Melo also has more of an eye for goal than Gilberto, which obviously is a bonus. Reports last week claimed that Arsenal had waved a Â£15m opening bid for Melo at Fiorentina, but the Serie A club will probably want a bit more before they say yes. If Glen Johnson is worth Â£17m, then a current Brazilian international who has his best years ahead of him must be worth at least as much. Bear in mind that Jose Mourinho is a Melo fan and the player could still end up at Inter. Melo says he’s more than happy to stay in Florence – which is exactly what a coveted player should say if he doesn’t want to piss off the fans of his current club. Of course, that doesn’t mean Melo won’t leave for the right price. I think Melo would be a better option than Denilson and Alex Song (both have bright futures but lack experience). If Arsenal have to sell Abou Diaby (who shows flashes of brilliance but is far too inconsistent to play the role of water carrier for Cesc) to fund the purchase of Melo, then I say Wenger should go for it. What say you? Definitely worth buying. I’ve watched him quite a bit in the Confed Cup and he’s BIG and strong, and aggressive. He’s a better version of Gilberto, more pace, more aggression, better control, better eye for goal and more intimidating. He’ll be great in the 4-3-3 with Cesc and Nasri just in front of him. There’s no doubt that Nasri needs to be more central, and Cesc needs more room to support the front players. yea i think we do need a midfielder like melo, though i still believe song can do the job very well. we need depth though that is certain, last season proved that. Does Arsenal need Melo? Yes, yesterday but today he is still the best piece of news I’ve heard for a while. But guys, dont you remember the hype surrounding another Brazilian midfield so tough he was christened “The beast”? Whe we finally brought him on a season long loan he was more of a pussycat than a beast. Does anyone think Melo might actually flop? I mean Klebberson flopped at Manure, did’nt he? Is’nt cause for caution? Melo surely had a very good Confederations Cup, and a very good season, as you say (I only watched him in the CC) and could be the answer to Arsenal’s midfield “problem”. However, whenever I think about the aforementioned “problem” two words come to mind. Miguel Veloso. I would be excited at the prospect of bringing him in, but don’t think he would quite fill the DM position quite the same way he fills it while playing for brazil. they play both him and Gilberto together, leaving Kaka and Robinho to pick up the counter. in the prem he would be up against much stronger opponents and virtually have to do the job on his own. I think he is an excellent player who reads the game quite well, but I think in the current arsenal squad and formation he would lack workrate and pace. Just a thought, but I hope he proves me wrong! I think he’s a perfect fit, it’s what we are going to need to knock down the bigger boys in the league. I hope Thomas can show the rest of our boys how to cover Drogba, and I think we need a strong guy like Melo to push around the Lampards, Gerrards, Barry’s of the EPL. I would like to see a defense that teams are afraid of, like RIO and VIDIC, then let the beautiful game be played up front.. Anyway I see it I have faith in the prof to do the right thing for the club. And I for one am happy with how he is handling this club and building it for the future. Anyone else amped to see more Wilshire this year? im thinkin he is one of a few possible solutions. raul albiol has fantastic experience and can play both dmf and cb, that versatility is something arsene really values highly. of course it looks as though he fits, considering his playing style etc but we will wait and see what happens. whatever does happen though, it appears its gonna happen sooner rather than later. a dmf is really needed though, im excited about tommy v, but wot i rly wanna see happen is gettin rid of adebayor and replacing him with somebody! He would be a good signing because he wud be the person who wud break up the play wen the other team have the ball.If wenger goes for a4-3-3 form it wud be better because Nasri(1 trick pony lol)wud have more space 2 play ininstead of always turning in while on the wings.I’ve seen him play a bit he is the player we need. Hahahahaha Now melo was a JUVENTUS player! Bye bye arsenal.